Queensland Urban Utilities maintains more than 100,000 fire hydrants across five local council areas, including Brisbane, Ipswich, Scenic Rim, Lockyer Valley and Somerset. We invest around $7 million every year in maintaining, testing and renewing hydrants, and work with the Queensland Fire and Emergency Services (QFES) to ensure each hydrant is easy to find and operates effectively. There may be a short water outage during planned hydrant work. If affected, customers are notified at least 3 days in advance. Fire hydrants are inspected every two years as part of our hydrant maintenance program. Crews make sure the hydrant can be easily seen, accessed and is in good working order. Information from these inspections is then used to schedule further maintenance and repairs as required. 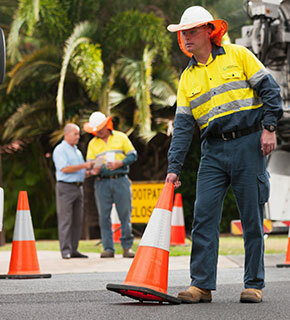 Queensland Urban Utilities also undertakes maintenance if any issues are reported by customers, QFES and other contractors. Fire hydrant testing is a rolling program which tests water flow to confirm hydrants perform according to the Department of Energy and Water Supply’s Planning Guidelines for water supply and sewerage. This testing helps determine the condition of fire hydrants. If a fire hydrant is not working as well as it should, we replace it as part of our hydrant renewal program. Queensland Urban Utilities has a renewal program to ensure hydrants across our network operate effectively. Renewals are scheduled when a hydrant is identified through our testing program. The community plays an important role in helping to keep fire hydrants in good working order. They are usually located on the nature strip and have a yellow lid. A blue cat’s eye on the road indicates their location. We appreciate your patience while this essential work is completed. If you experience prolonged water discolouration following fire hydrant work or require further information, please contact us on 13 23 64 (24/7).